Improved DVD analysis kernel to locate the DVD title more accurately. Improved DVD decoding mechanism to process new DVDs released in 2019. Fixed some bugs for all engines. 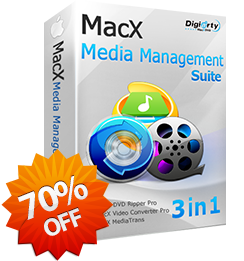 This software suite includes MacX DVD Ripper Pro, MacX Video Converter Pro and MacX MediaTrans. With this all-in-one software package, you could convert and backup DVDs, download videos, convert among 4K, HD and general videos, record & edit video, transfer data between iOS devices and computer in two ways. Buy the software package today, get lifetime updates and tech support. • Transfer photos,videos & music between iPhone iPad and Mac. • Auto compress & convert videos to Apple friendly formats. • Delete photos from camera roll. Customize ringtone for iPhone. • Backup files before upgrade to iOS 12, iPhone XS/XS Max/XR. • Convert among UHD 4K, MKV, M2TS, MP4, AVI, FLV videos. • Download video and music from YouTube and 1000+ sites. • Transfer any videos for viewing on iOS, Android mobiles. • Record screen, edit video, make photo slideshow easily. It receives high praises from reputable Mac magazine and sites, like MacWorld, Maclife, CultofMac, Tuaw,Toptenreviews etc. Our support team is available 24 hours a day, 7 days a week to provide quick professional solutions for customers.